Love the new iPhone? Or are you waiting for the next cool Samsung launch? When you buy a smartphone, it is generally available on a contract from your service provider, unless of course, you go and bring your own device. Let’s face it, not many do that. Unfortunately, though, you are locked to their network till your contract expires and cannot use any other carrier. Often, you are locked to your carrier for as many as two years once you buy the new phone. The IMEI number of your phone is linked with the SIM by your network carrier and you can’t unlock it easily. Users face a number of difficulties as they cannot switch over to other carriers, have to pay high roaming charges and cannot use the phone as per their wish. You can find many free phone unlocking software on the internet, but not all of them works as promised. So we have taken it upon ourselves to bring you the best solutions that are guaranteed to work. Most of the applications use your IMEI number to generate a code to unlock your phone for free. Some may use a different technique, but the concept is the same. So let’s dig in without delay! doctorSIM makes it really easy to unlock your phone. You have to fill up a request form on their website and choose the brand of your mobile, model number, location, and current network carrier. Once they have received the request form and payment, you will receive an email with detailed set-by-step instructions to unlock your Android phone. If you have any problem with the process, the customer care is always available on chat, telephone, and social media. This SIM unlock software removes the restrictions of your network carrier permanently and you will never have to repeat the process. You can update your phone normally and use it with any network across the world. 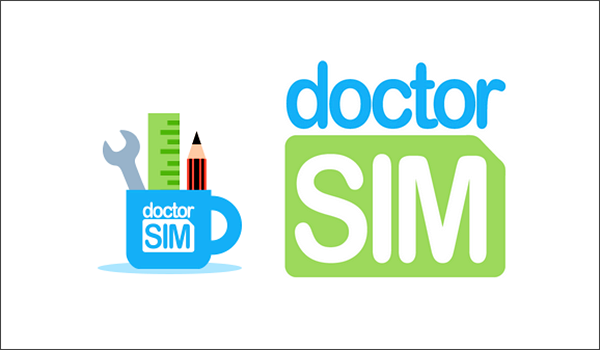 doctorSIM also provides a bulk discount when you have more than 5 phones to unlock. It also works for blacklisted phones though it doesn’t remove it from the blacklist. Your warranty will also stay intact using this legal process! UnlockBase is one of the best phone unlocking software with a simple and easy to follow the process. The solution has been in the market since 2004 and unlocked over 5 million phones in 165 countries. You have to send in your IMEI number and select the model and manufacturer of your mobile. UnlockBase claims to have the best turnaround time in the industry and sends in your code as soon as possible. You need to follow the easy instructions and enter the code using your keypad to remove restrictions from your phone. 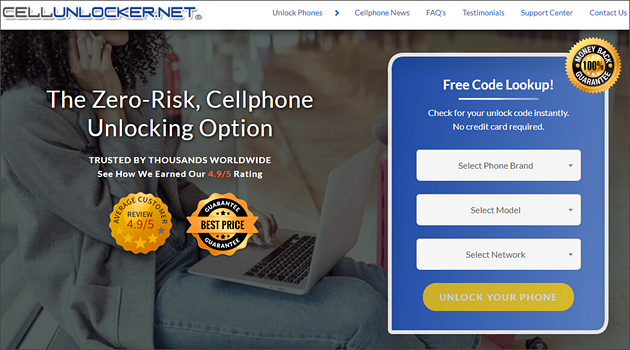 This mobile unlocking software comes with a money back guarantee and promises the lowest price on the internet. In case you find any other cheaper tools, the company is ready to negotiate their prices. You can also get any help you need from the 24/7 dedicated customer service. 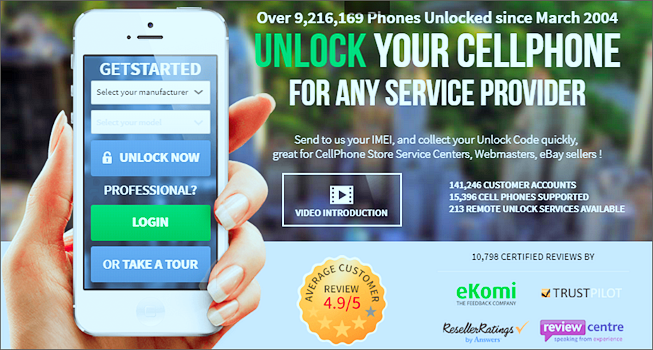 The Unlockr has partnered with Unlock My Phone to bring you the IMEI unlock service. The method works for both Android and iPhones and supports over 15,395 mobile phones around the world. The service has over 141,201 satisfied customers who used the cell phone unlocking software successfully to gain freedom! Similar to the other phone unlocking services, you need to choose your model and make and send in your IMEI number. You can then make the payment using a number of payment methods such as Paypal, Western Union, cryptocurrencies, debit and credit cards. The website also provides an option to track your order in case there is a delay in receiving your code. TheUnlockr works even for difficult-to-unlock phones as the team consists of hackers and expert engineers. You can remove the restrictions of any carrier in the world and insert different SIM cards without any problem. Unlockunit unlocks GSM phones as quickly as in 1 minute! You can unlock your phone in over 200 countries like USA, Australia, Europe, and Asia. The company has been in business for more than 7 years and unlocked over 1 million phones. You can use the technique for different providers like T-Mobile, AT&T, Vodafone, Rogers and more. The application needs your IMEI number which you can access by dialing *#06# on your phone. You have to make the payment and provide other details of your mobile and location. To unlock your phone with this unlock tool, you have to first insert an unregistered SIM. Then just provide the unlock code you received in your email to unlock your phone permanently. The phone unlocking service comes with a friendly team of representatives who are always ready to help you and answer your queries. CellUnlocker is not a free phone unlocking software, but you can look up for your code for free! You can be otherwise sure of competitive pricing and even get discounts on your order. 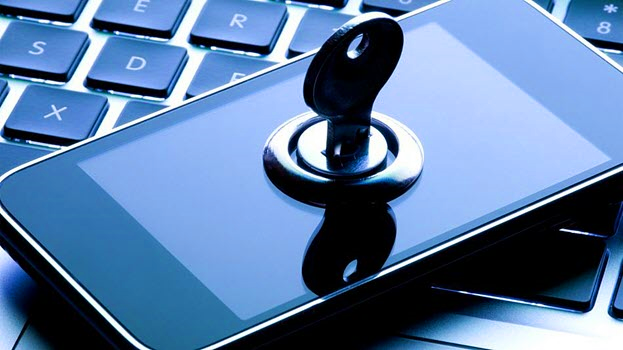 The safe and secure tool unlocks your phone using the IMEI number. After you put in your order, it is processed automatically so that you get the best turnaround time. Some carriers and models of phones require extra time, so you may need to wait. You can use this phone unlocking software to unlock Android phones on GSM networks. Once the phone is unlocked, you can use it on most of the GSM networks in the world. You can change SIMs as many time as you want, without ever needing a password or code. The service comes with 24/7 support to walk you through the simple steps. If you have been wondering how to unlock a phone for free, this might be your best deal! 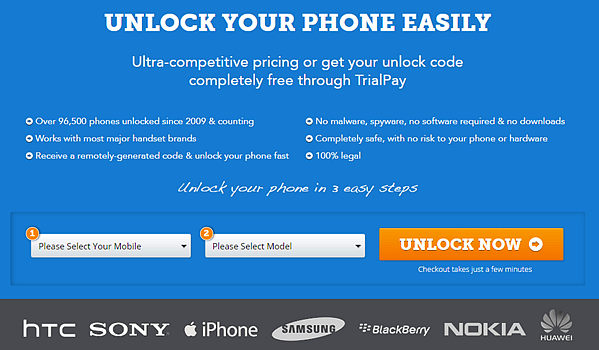 FreeUnlocks is a paid phone unlocking service, but you can get it completely for free using TrialPay. There’s nothing different about the unlocking mechanism- you need to provide your mobile and carrier details along with your IMEI number. In a short time, you will get the unlock code and simple instructions by email. The solution was introduced in 2009 and has been used to unlock more than 96,500 phones. You don’t have to download anything, so there are no worries of malware or spyware. It is a 100% legal process without any threat to your mobile or hardware. You can unlock different brands of mobiles like Sony, Apple, HTC, Samsung, Blackberry, Nokia and Huawei. 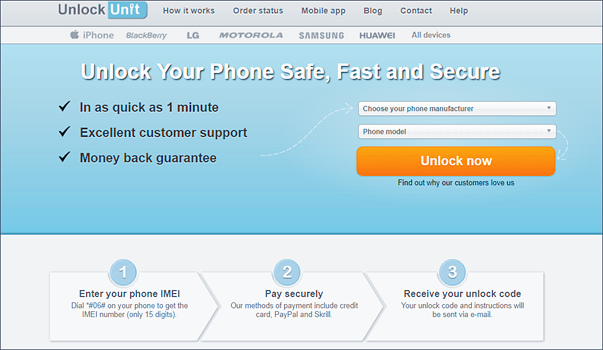 If the service is not able to unlock your phone for any reason, you will receive a full refund of your payment. 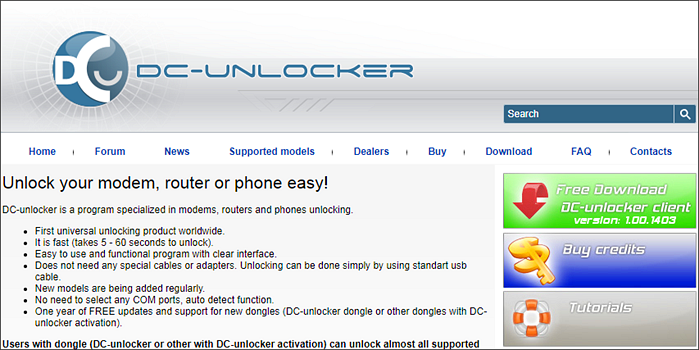 DC-unlocker is a versatile phone unlock software which also works for modems and routers. The tool doesn’t use your IMEI number like other applications and you have to download the DC-unlocker client on your computer. The program comes with a user-friendly interface and easy to use functions to unlock multiple devices in under 1 minute! You can use a standard USB cable to connect your device to your computer and perform the unlocking process. The mobile unlock software automatically detects your device and there’s no need to choose COM ports. You can download DC-unlocker client for free and try it out on your phone or modem. Apart from unlocking, it can also be used to generate firmware update codes. The website also offers other useful tools for your Android phone like unlimited unlock code generating programs. Tip: If the data in your phone is lost or deleted by mistake, here is a great software that will help you get them back quickly, that’s Gihosoft Free Android Data Recovery. Click the button below to download it now! Mobile phone unlocking software can save you money while traveling by enabling you to use local SIMs to avoid hefty service charges. You can also increase the value of your phone and get a better price when you sell it. The process has also become legal and the applications make it quicker for you to unlock your phone. So if you want to break free, try out of the above solutions and let us know what you feel about them in the comments! Which one are you going to try out?